A sterling silver necklace of a finely detailed crescent moon and bezel set cabochon. A little agate druzy slice on an open link sterling silver chain. Agates vary in size but are about 1 - 1 1/2" inch. 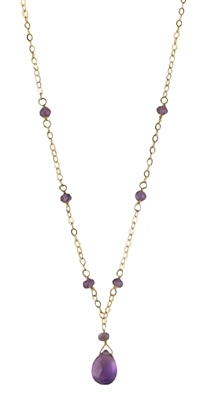 A prong set gemstone on an open link chain sterling silver necklace. Sterling silver necklace of a small faceted stone and pearls on open link chain. Shown in Ruby. 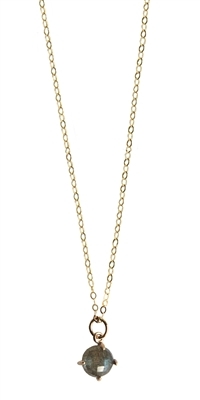 Sterling silver necklace with a bezel set round cabochon on an open link chain. Each stone is 8mm (just over 1/4" inch). Shown in white moonstone. A sterling silver necklace of finely detailed wings and a bezel set cabochon. Sterling silver necklace of a smooth silver circle and faceted gemstone briolette on a an open link chain. Sterling silver necklace with natural gemstone cabochon and faceted briolette. 1" inch pendant and 16" inches of chain. Handmade in the USA. 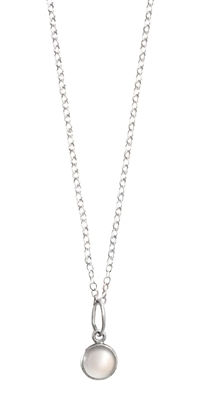 A faceted cushion cut gemstone on an open link sterling silver chain. Sterling silver necklace with 10x8mm bezel set gemstone cabochon. Sterling silver necklace of open link chain and a large smooth gemstone briolette. Sterling silver necklace with a faceted natural gemstone briolette. Shown in green amethyst. Sterling silver necklace with a faceted soft rectangle on an open link chain. A sterling silver crescent moon with a 4mm moonstone cabochon. A necklace of three sterling silver hoops with faceted briolettes on an open link chain. A necklace of a faceted natural gemstone briolette and faceted beads on an open link sterling silver chain. Shown in Peruvian Chalcedony. Sterling silver and natural Opal necklace. Shown in natural Australian opal and Peruvian opal. Sterling silver necklace with 5 faceted briolettes. Shown in multi color. Each briollete is approximately 5mm (1/4" inch). 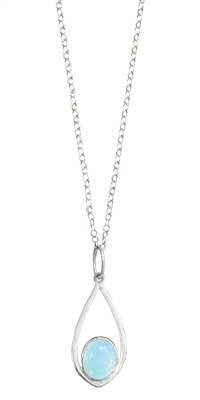 Sterling silver necklace of a double pointed herkimer diamond on an open link chain. The Herkimer Diamonds vary in size and width of 1/2" inch - 3/4" inch. Sterling silver reversible light and dark side of the moon necklace with a faceted rainbow moonstone bead. Blackened sterling silver necklace with a bezel set gemstone cabochon. Shown in natural white opal. A sterling silver necklace with natural Australian or Peruvian opal. Opals are free form shapes and each are about 3/4" inch.